Just like Beys that come in different variations, arenas or Beyblade stadiums, onto which these spinning tops are launched to duel with each other, also come in different forms. Each arena is either an upgrade of its predecessor or and a whole new product with new features. Below is a list of some of the most well-known Beyblade stadiums. 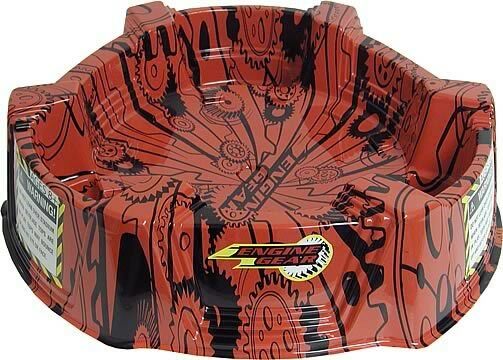 As its name implies, this was the very first Beyblade stadium ever manufactured by Hasbro. Because this type is very small battles, it is best for Defense type Beys which does not require a big space to perform well during battles. If you are looking for battles that is characterized by beys slamming each other, this is not the stadium for you. An average size beyblade arena with enough room for small and less powerful battles to take place. Its pockets are also quite deep which makes it hard to escape from once caught in. Best suited for all types. The 3rd stadium released by Hasbro which was designed for multiple battles among larger Beys. It can accommodate 2 to 4 beyblades in one battle. It is very similar to the Vortex arena except for the barely there indented skinny line that beyblades tips follow along in a circle. This is a great stadium for all types of beyblades. One of the best Beyblade stadiums around. Average sized and features slopes that can either distance or force beyblades to interact with each other during battles. Excellent stadium for all types. 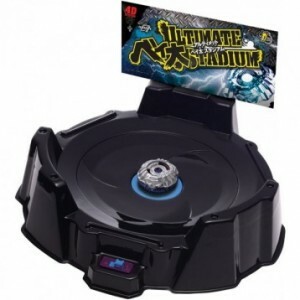 One of the "challenge factors stadiums" Hasbro and was even used as the main stadium for the Beyblade World Championships. It has a small bump rising in the center of the stadium, which can affect Bey performance during battles. The bump can mess up defense type beyblades' attack strategy. Some attack type Beys can maneuver over the bump but lose their spin power in the process. Nevertheless, this stadium is ideal for attack types beyblades. This is the second of the challenge factor stadiums and is the 2nd hardest in its category. The challenge factor is 12 small tiny bumps circling the center of the stadium. The circle that these bumps create is ideal for most defense type beyblades as it creates a small barrier from other beyblades. The bumps also extremely mess up the attack pattern of an attack type beyblade. 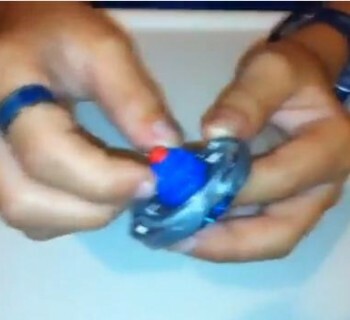 When a beyblade goes over one or more of the 12 bumps the beyblades loses a great amount of torque (spin power). This stadium is the exact opposite of the Cyber Draciel stadium and is best suited for Defense type beyblades. Best for defense type Beys but most beyblades work relatively well in this stadium. It features an almost flat surface except for the very slight tilt. 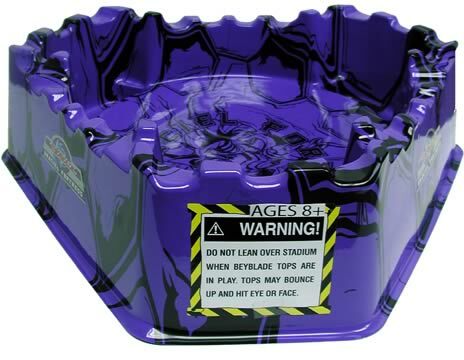 Touted as the best of all attack-type Beyblade stadiums made by the Hasbro. Its slopes are the most inclined of all the stadiums making it a great arena for attack type Beys. Suits all types of Beyblades because of its slopes. Another challenge factor type stadium from Hasbro. Its challenge feature is a sloped medium sized circle in the center of the arena that affects a Beyblade's pattern of attack. This stadium is best suited for Endurance types. One of the first stadiums released by Hasbro. It is similar to the Dranzer flame field that is suitable to most Beys. 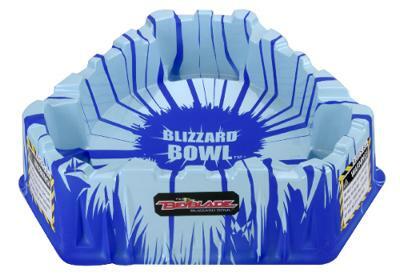 However, the center of this stadium has deep slopes drawing beyblades to a battle frenzy. It is perfect for defense and attack type beys. When you are always on the go, this stadium is perfect for you. It a compartment on the bottom that can hold several beyblades and accessories. It can also be folded up for maximum portability. However, you cannot expect action on this stadium as its slope is very basic and there are no pockets that can be a challenge to battling beys. This stadium is suitable for all types of beyblades. Exactly the same as the Mobile stadium except for its deeper slopes so you can expect a bit more of action from this arena. It is suitable for attack type Beyblades. Another challenge factor stadium and is considered as the most difficult to battle in. Its challenge feature is the hole in the middle that can easily stop defense and endurance type beyblades. It also has some raised squares around the outer part of the arena to mess up attack beyblades. 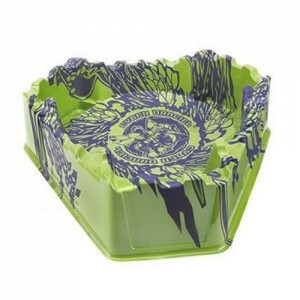 The raised squares also prevent beyblades from going into the pockets more often. In other words, this stadium is designed such that no type of Beyblade can perform well on it. A rectanglular beystadium that is designed for Heavy metal Beyblades. It has four pockets (other arenas only have 3) that does not pose much of a challenge to most beys because they are very shallow. It also has an average slope making it best for any beyblade type. For HMS beys, the Endurance types are best suited. Almost an exact replica of the Heavy Metal Stadium but it has a very realistic tornado ridge near center of the arena that can help attack type Beys to glide along and smash the opponent bey into smithereens. No doubt about it, attack type beyblades work best in this arena. Features a small flat circle in the center perfect for all beyblade types, particularly defense types, to roam around. A large beystadium along the lines of the Vortex and BladeBreaker. It can accommodate battles of up to 2-4 beyblades at once. 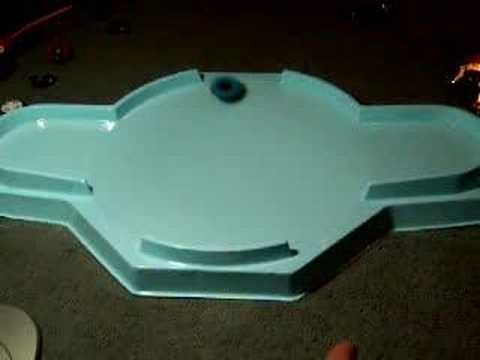 It is also the flattest beyblade stadium ever created and the only stadium of this size to feature a challenge factor: a small bump in the center to mess up defense and endurance beyblades. Almost all types of Beys will have a hard time performing well on it. The first large beystadium ever released and considered as the best of its kind. 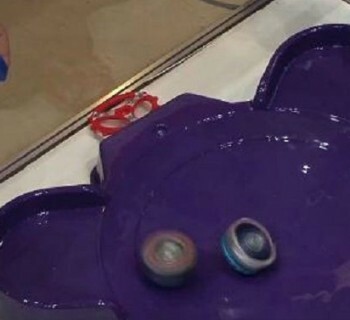 It has no challenge factors and posses a nice slope to give all beyblades a decent advantage. It can accommodate 2-7 beyblades in one battle. Defense and endurance type Beys can perform well in center part of the arena while the nicely sloped the outer part can be advantageous for attack types. As its name implies, this stadium is designed for the optimum performance of attack type Beys. It has good slopes that draws the blades into the center for intimate battles. 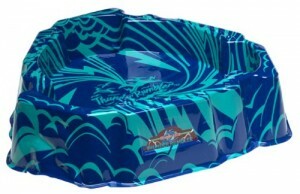 Features a tornado ridge on the removable top half that also has a medium sized hole that the blades can fall into. The lower stadium is a defense endurance type arena. All types of beyblades can work well here but attack types work best with the ridge. A flatter version of the red attack stadium. This stadium is not recommended for attack type beyblades because of the lack of power your blade will have. This stadium suits great Endurance combos which are protected from an attack types power. This Stadium is very different from the others. You can install magnets any way you want to add challenge to battles. Only beyblades that have a metal tip or a magnet core/weight disk will be affected by the magnets. Great for all types of beyblades. The smallest of all beyblade stadium in the market. because of the limited space, you can expect Beys to rough it out like crazy in this arena. Perfect for all beyblades types. The largest beyblade stadium ever created, with a span of about 3 feet. It was originally designed for RC (Remote Control) beyblades, but can be used with regeular beyblades. Beys are launched in the oval ends. This is the very first stadium to feature a tornado ridge. It is an extreme Attack type arena. Features a spinning center that can be switched to left or right. It also has barrier fences which can be knocked down to be like a traditional Takara stadium. When the barrier fences are up it makes battles harder and more inescapable, but they get knocked down very fast. This arena is extremely fast paced and throws the beyblades all over the place for little to no control. 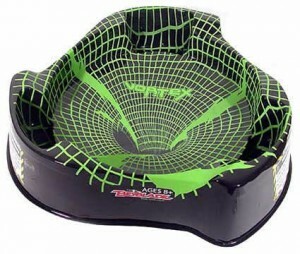 This stadium is suited for all types of beyblades but winning a battle can be quite a challenge in this stadium. Almost a replica of the Wide attack stadium except for the flatter slope which is ideal for endurance type beyblades. 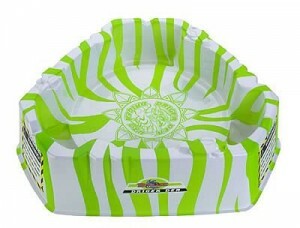 It is also quite bigger the the regular arenas and can accommodate battles with 2-4 beyblades. This stadium is best for battles with 2-4 beyblades. 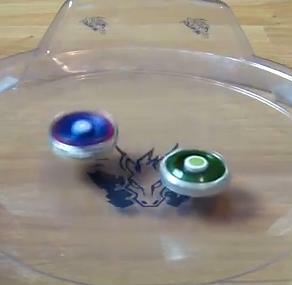 It has a more sloped surface which draws battling beyblades toward each other. This stadium is best suited for Attack types.